Majestic Ring in solid 9 K Gold and Sterling Silver Labradorite Zircon Carnelian and Turquoise gemstones queen ring . Ring size 4 5 6 7 8 9 10 11. Solid 9K Gold and Sterling Silver set with Labradorite, Zircon, Carnelian and Turquoise gemstones. 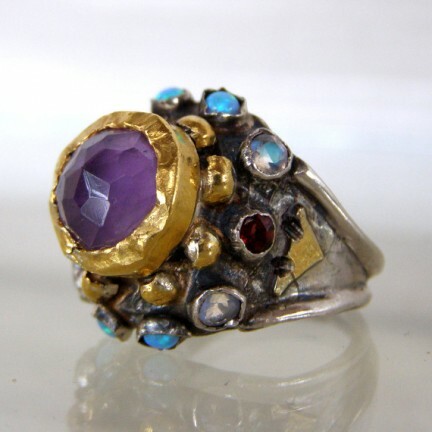 Gentle Royal Handmade Queen Ring. This queen ring is adjustable to any size, it has a small opening that can be adjusted it to fit your finger. Center stone size - 10mm x 14mm. Size: This queen ring is adjustable to any size, it has a small opening enabling you to adjust it to fit your finger.